It doesn't look like much, some greenery in the shade with a splattering of white flowering plants amongst them. The white flowers belong to Chives and I have an incredible abundance this year for some reason. The church to which I used to belong had a garden where they grew fresh vegetables for a local food pantry. Every year, they encouraged people to "plant an extra row" in their home gardens and bring that overflow to the church for the food pantry. As I have noticed, it is extremely hard to eat fresh on a budget. Fresh vegetables and fruits are extremely expensive when compared to frozen or canned. It's a conundrum that needs to be addressed in order to get people eating better. Food pantries face this every day. It's much easier to provide cans of diced pears than to provide the real thing. But, around here, in the summer, they take donations of fresh vegetables and provide those to their clients. So, for a few years, we would take an extra plant or two and return with the produce in late August or September. One year, they had excess herbs. I had something of an herb garden on the side of the house. I thought it might be neat to grow something different. We grabbed a pot of chives, found a place for it and rather left it. Sometimes, I would see it and remember it was there, but most of the time, it was just some green thing happily growing. This year, it's everywhere behind the house. It's spread from the deck south along the area where I store the garbage cans. The photo above is only a third of the range in the back. I'm really not fond of chives but I like the flowers. At this time of year, there's not a lot blooming so these flowers are an exciting addition to the back. 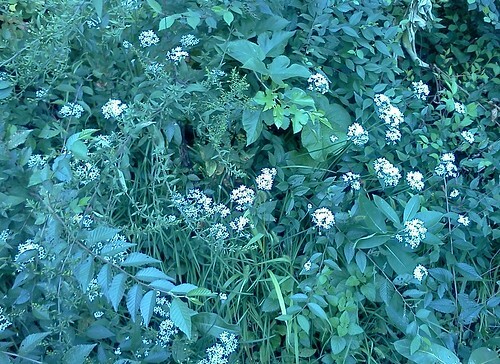 That being said, when I get around to clearing some of this brush, some of the chives will go too. It's just sort of inevitable. Still, this was a pleasant surprise.